I really liked Bill and Ted's Excellent Adventure when it first came out. I was ten years old and a bit of a history nerd. So seeing characters like Billy the Kid, Abe Lincoln, and Joan of Arc dealing with life in modern day California was just a lot of fun. I also thought the end of the movie used some real clever tricks when it came to time travel. It was just about a perfect movie to my ten year old self. Despite my love of the movie, I never watched the cartoon, read the comics, etc. It just seemed like a pretty closed work that any expansion to would ruin. Because of this, I have never even seen Bill and Ted's Bogus Journey. This comic picks up just as the second movie ends. Bill and Ted have won the Battle of the Bands. They have written a brilliant first song, but they have no idea how to progress from there. The villianous De Namolos who came back from the future to ruin the timeline is being carted off to jail. 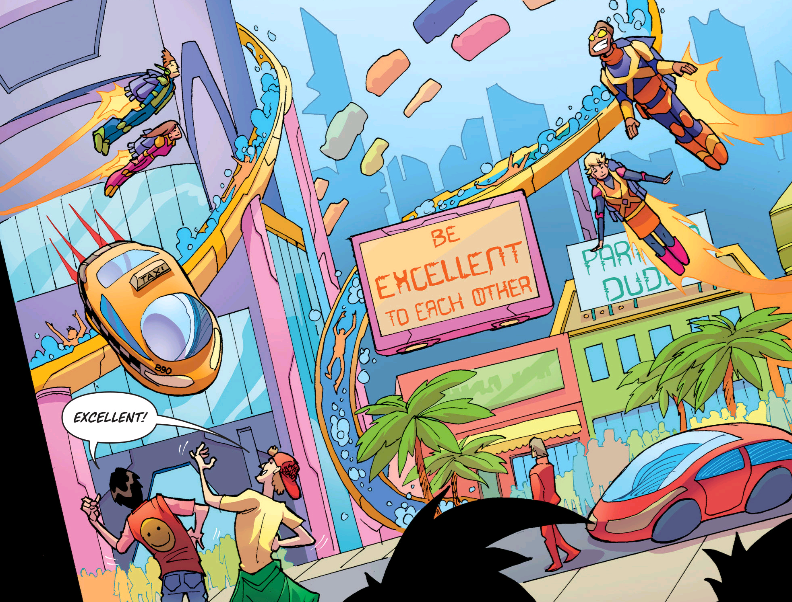 Tourists from the future have come back to see them, which inspires Bill and Ted to take a trip to the future to try and cheat and find out what some of their future songs would sound like. Basically steal inspiration from their future self. While they are there, they find a young DeNamolos being bullied as a high school student. I will admit up front, it is very possible that most of my problems with this book might have come from the fact I've never seen the second movie. It is definitely required viewing. The issue doesn't make much of an effort to catch the reader up, assuming they are fans and remember things that happened in movies that came out 25 years ago. They could have learned a lot from the Galaxy Quest series IDW is putting out. That series made sure that new readers or readers who might not remember every detail of the movie can feel comfortable. Bill and Ted distinctly does not. The other issue I had with this comic is that it just doesn't quite feel big enough. Until you get to the last page, I kept finding myself wondering "Why does this comic exist?" It just felt very small in scale throughout. All that said, this wasn't a bad comic. 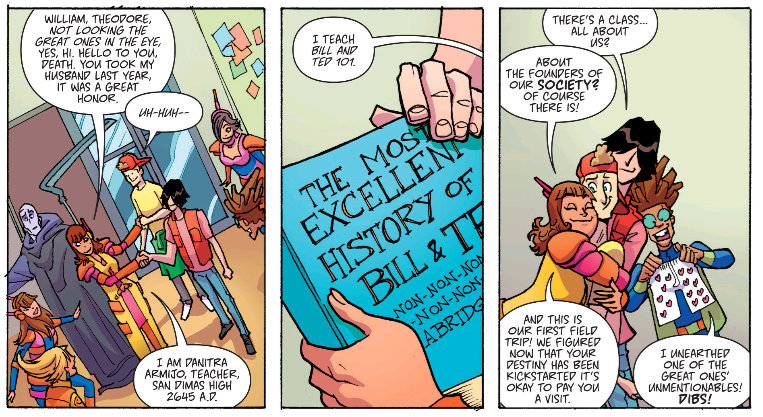 I thought it captured Bill and Ted's voice very well. And it was genuinely funny at times. I especially laughed when there was a character who went out of the way to tell Death they were honored at the fact Death took her husband recently. One thing I hate in comics is when you get a terrific cover image, and the interior art is by someone else entirely. I was actually thrown at first by how different the interiors looked. I was ready to hate it, just because I thought the cover was so perfect. But, Jerry Gayland ended up winning me over.All the scenes in the future were real bright and vibrant! This issue also has a backup story, which actually takes up about a 1/3 of the actual comic. 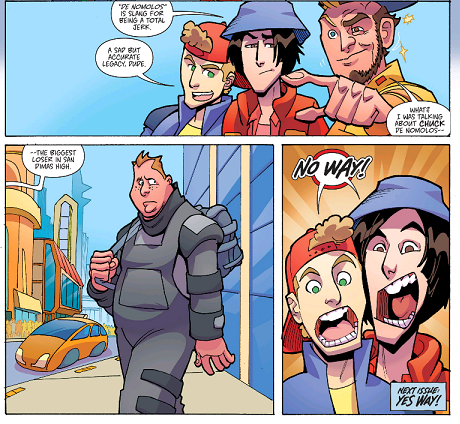 Written by Ryan North, drawn by Ian McGinty, Colored and Lettered by Fred Sterring. It was just an awful mess. I couldn't even get through it. When I checked the credits and saw it was by Ryan North,I realized why. His Squirrel Girl was a huge disappointment too. This awful backup ended up dragging down by enjoyment of a book I was already iffy about. 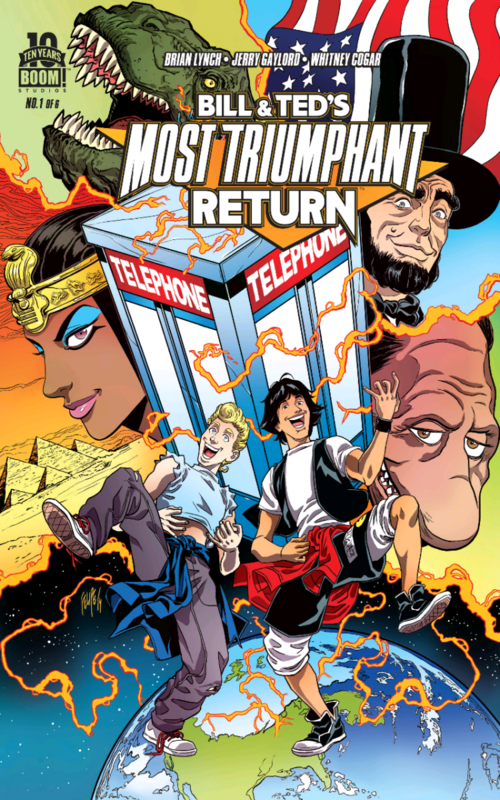 If you liked BOTH Bill and Ted movies, this comic might appeal to you much more than it did for me. But, I definitely found myself losing interest, and the awful backup killed it for good. I'm sorry to say I won't be picking up the rest of this mini. End could be a huge game changer. Requires reader to have seen both movies and remember them very well. Until you get to the end, the book feels real small in scale. Is it worth your $3.99? For me, I would say it wasn't worth the 4 bucks I paid for it. But fans of the second movie might feel differently. I would say that if you do buy this book, be aware that you are only getting 2/3 a comic...and the backup that fills the rest is awful.